Instead of thinking about how strong and powerful you are when practicing the internal arts, consider that the internal arts focus on how softness can overcome hardness. Patience, persistence, and precision can render a strength as strong as a river's current, if one considers the longer road; regardless of one's style or practice. This idea can apply to anyone whether they are a martial artist or not. Persistence can pay off. Patience, even if that means just closing our mouth and taking the time to listen to what another person has to say can be a method of beginning of going inside and training internal strength. When you are soft and still, and yet keep moving gradually together with your opponent's movement, you create the opportunity to discover your opponent¹s intentions and understand how best to use the least amount of force to neutralize a given situation naturally. When this happens, you begin to appreciate others practice more, and start to learn more by watching closely. By not considering style and instead paying close attention to people's inner strength and force, you are able to ultimately see that the outer shape has little to do with what can potentially be accomplished. The internal martial artist is more concerned with listening to what's going on inside, than they are with an outer show of force. For example, take the beginner who sees a powerful demonstration of fa-jing from the outside and sees the force erupt from the demonstrator's movements. They may even pick up on the shifting of the weight one way, while the hands go the other. However, what is missed is that the practitioner who can maintain stillness and issue force is, in my opinion, truly issuing from the internal. But again most of us enjoy a good show. But to the person initiated in the realm of the internal arts, the person who can stand still and issue, mystifies the advanced and is often unseen by the many. This issuing of force comes from being able to accomplish more with less. By using rootedness in the feet, with the ability to substantiate some joints and insubstantiate others, this issuance of energy appears to be like magic, because it happens so slightly that it¹s point of origin cannot be detected or seen. These slight changes and differences are all around us. Stand or sit still and watch a tree and you will see the small changes and growth that take place if you are patient and still. Stillness is one of the greatest attributes of internal martial arts, and stillness and the patience to stand still for long periods of time, even when moving, is where the magic in the internal arts resides. The smaller you can be when moving or standing, the more refined your practice can become. This doesn't mean that you sacrifice the full stretch, but instead, use more of your being to accomplish it; instead of utilizing one aspect which leaves the practice one dimensional, and easily detectable ultimately by your opponent, you extend your potential by involving more of your entire being. I remember training for competition in T'ai Chi. I was fixated with kicking higher, sitting in lower postures, and looking "perfect" I was willing to sacrifice the ability learn more about the internal with true teachers, both Chinese and American just to win. Using all my resources, I traveled greatly, and went on to win many tournaments in forms divisions. However, in my opinion, I had lost the opportunity to gain more intrinsically valuable insight and skill. And years after, I punished myself more feeling I had wasted years that I could have dedicated to self cultivation. However, because I went through that and saw so many different levels over time, as well as dealing with both winning and losing, I have been able to more fully concentrate on what is essential as time has gone by. Concerning more on the uselessness of high kicks and low postures, I remember one time watching Ma Yueh Liang practice the slow set in his home with a group of grand students who trained in Wu Style in the People's Park in Shanghai (Grand students meaning their teachers were students of Ma.). The students made a concentrated effort, in my opinion, not to raise their leg to kick high, nor lower them self too low when pushing down. They also didn't move much, nor turn their waist grossly. The young, uninitiated student that I was, asked Ma in front of these students (as if to make my point) if it should be a goal to kick higher or squat lower. His answer was that it should be a goal to keep the Lower Dantian (located in the center, lower abdomen region of the body) at one level. When kicking stretch from there, but keep the Lower Abdomen still. Stretching to kick more from the hips. When pushing down, also stretch from there, but focus on stillness and economy of movement. Again, using the hips to lower the body downward. Zhou Zhan Fang, a senior student of Ma, also discussed this idea with me once, and pointed out pictures of both Wu Chian Chuan and Yang Cheng Fu, and how both masters were able to keep the lower dantian seemingly at one level, and stretching from it as they moved through the postures of their respective forms. Zhou Zhan Fang (an advanced student of Ma Yueh Liang) and Gerald Sharp pushing hands in Shanghai. This is why the idea of sitting back when moving to turn, which has become a hallmark in professional T'ai Chi Tournaments, especially both in China and now in America, is detrimental. Sitting back was designed supposedly to help beginners move easier and avoid excessive stress on the knees (thought to create T'ai Chi knee). However, nothing could be farther from the truth and just the opposite can happen. Instead, moving from the lower dantian, helps focus the energy downward, and helps movement from one Running Spring (a point known as the Yongchuan located behind the ball of the foot) even more useful and applicable. This stillness maintained in the lower abdomen can begin to release stress held in the shoulders, neck, elbows, and fingers. The movement from one running spring to the next is more fully achieved when the lower dantian is kept downward, almost pointed towards the earth, and the ankles relaxed gradually with each and every movement. This focus on pointing the lower dantian downward, can lead to a more deeper quality of breathing. When you inhale and maintain concentration on your lower abdomen, your breathing will be gentle and easy. This not only helps to bring more oxygen into your system, but develops strength in your diaphragm to exhale at least as long as you inhale. Breathing from the diaphragm encourages chi, or fresh energy to be gathered during practice and stored in the lower dantian. Keeping the Lower Dantian or lower abdomen at one level also helps increase the ability to drop one's center of gravity without bending your knees and placing more undue pressure on the knees -- more than is necessary. So the next time you see a flashy set of moves performed, ask yourself: What is the person gaining from such practice, besides people's attention? Also ask: What more could they do with less? There's a great deal to be said for efficiency and economy, and a great deal to be gained to create more peaceful calm energy both inside the practitioner who follows the gentle path, and by those outside the practitioner's vessel. 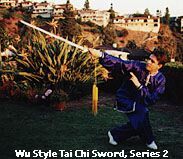 Your comments concerning this information as presented here are welcome, and we also welcome you to check out the information about the various internal martial arts we feature on this site; as well as our store which continues to offer a wide array of instructional and demonstration material on the internal martial arts. Good Luck in your studies, and continue to persist in your practice. The pay off into a deeper exploration of yourself is rich and rewarding not only for yourself, but for those who encounter your peaceful, positive attitude, and your serenity on a daily basis.